What does the title of this blog mean? One of the great fortunes of studying the First World War at A-level right now is the wealth of interesting resources available for you to access. It wasn’t always this way, of course; in the dark days when I first began writing this blog you could barely get an amusing gif of Fieldmarshal Haig tripping on a duckboard. Not exactly true, but you get my gist. The centenary has been a good time for students of First World War history and literature to learn about life from 1914 to 1918. On Monday I was lucky enough to catch an episode of Dan Snow’s ongoing Radio 4 series about the conflict, ‘Voices of The First World War’. This series is a goldmine for those of you fretting about your lack of historical knowledge about the war. In the UK you can listen online or download the series as MP3 files (outside the UK, I’m not so sure). Each episode in the series is under fifteen minutes long, and focuses on a single aspect of the war, from First Impressions on the outbreak of the war to most recently (and fortuitously given my last post!) the emergence of new technologies like Tanks. The episode that caught my attention was entitled ‘Sheffield and the Somme’. It is, admittedly, an upsetting program. In it, Sheffield locals give their own firsthand accounts of the effect upon the community of the massacre of the Sheffield City Battalion, or as they were then known, the ‘Sheffield Pals’. The Pals Brigades are one of the more sobering facts of the First World War. They were a successful recruiting method whose formation had unseen and tragic consequences in battle. Men from a particular locale or men who found themselves in a particular type of employment could enlist with friends and colleagues with the prospect of staying with them for the rest of the war. In 1914-15, this break with army tradition was felt necessary to encourage mass conscription. The New Army formed- also known as Kitchener’s Army, named after the Secretary of State for War- was an army of millions, ready for active duty by the end of 1915. In fact, many of the Pals brigades first saw action in the battle of the Somme in July 1916. The unforeseen consequence of this method of recruiting was that when a battalion faced a massacre, as the Sheffield Pals did on the first day of the Somme, the area from which the Pals brigade was taken took disproportionate and catastrophic numbers of casualties. Between July 1st and July 3rd, 1916, the Sheffield Pals- which had recruited somewhere between 900 to a thousand men in two days in August 1914- sustained 495 men dead, injured or missing. The terrible consequences of such massed death was keenly felt in the districts from which the men came. Whole cities felt the devastation of loss. Hindsight is a wonderful thing, of course, when we judge the formation of such brigades, and certainly they played their part in the creation of a large and well-trained conscript army. Yet it is too little noted that foresight is a wonderful thing too; would that it had been more in evidence in British plans for the conflict. Sheffield writer John Harris notes of the Sheffield Pals, they were “Two years in the making; ten minutes in the destroying. That was our history”. ‘Sheffield and the Somme’ captures this shocking moment in British history through the dignified testimony of those who suffered. It is well worth your attention, as is the rest of the series. Should you wish to read on- particularly, perhaps, if you are reading Whelan’s ‘The Accrington Pals’- there is also an excellent website, Pals.org.uk, which details the formation of several of these brigades. A 1904 illustration to HG Wells’ 1903 tale, ‘The Land Ironclads’. The Guardian ran an interesting article yesterday on their archive blog, commemorating the centennial of another military first. One hundred years ago this week saw the first use of tanks on a battlefield. ‘Dreadnoughts of the Trenches‘ reflects on the Guardian and Observer’s early coverage of this new technology. The journalistic reaction at that time to the immediate potential of these vehicles was, unsurprisingly, enthusiastic. By 1916, the ongoing stalemate on the Western Front had bred desperation for any breakthrough that might bring the war to a conclusion. For a little while, tanks seemed like they might be just the kind of mercurial invention that could smash through the stasis of trench warfare: a new cavalry, perhaps, whose momentum could help speed Britain to victory. Tanks were only the latest invention to fail to realise this dream. The history of tanks demonstrate, of course, the invention’s subsequent effectiveness: the successful Blitzkrieg of the second world war was made possible by German Panzer divisions, for example. Yet the immediate employment of Tanks during the Somme did not lead to a lasting breakthrough. The first generation of tanks used at Flers-Courcelette, the Mark I, were mechanically unreliable and struggled on the ragged terrain. In fact, the first real success of the war using tanks did not occur until over a year later, at the Battle of Cambrai in November 1917, when over 400 Mark IV tanks overran German defences. Where tanks were an immediate success, however, was in terms of their imaginative potency. I think we can get a sense of this in the early naming of tanks, highlighted in the article: the dreadnoughts of the trenches. Dreadnoughts were big-gun battleships first produced in the early years of the twentieth century, so named after the revolutionary design of the British battleship HMS Dreadnought, which first saw service in 1905. The Dreadnought became a public obsession in Britain during the global naval arms race of the early twentieth century. Both terrifying and effective as a weapon of war, dreadnoughts were seriously described as “a most devastating weapon of war, the most powerful thing in the world”. So, if the tank were like the Dreadnought, who then could stand in its way? The metaphor had persisted throughout the tank’s development. Tanks were the product of a British focus on the development of armoured vehicles, led by the Landships Committee in early 1915. The name ‘tank’ in fact only emerged as a code, to hide the true intentions of those developing the vehicle (suggesting a vehicle used to move water, perhaps in hot climates like Mesopotamia). The term ‘Landship’, on the other hand, gave away too much of the designers’ intentions. The true objective was a mobile, well-armoured and armed fortress that could rove the battlefield with the impunity of a battleship on the sea. There is an interesting lesson in the power of metaphor here, perhaps. Metaphor, of course, is a conceptual habit of human beings: in using metaphor we have one set of thoughts and images (the world of the land, and battle in the trenches, or a muddy field) and carry this over to another set of dissimilar thoughts and images (an armed battleship on the sea, say, denoted by the words ‘Ironclad’ or ‘Dreadnought’). Out of the interaction of these different forms of knowledge, a novel thought or image is sometimes created: here, a ‘Land Ironclad’. The well-judged metaphor is something more than just a plausible concept: it has an emotional, persuasive, almost pre-rational weight. Anyone who loves poetry knows this. The notion of the Land Ironclad was ultimately a thought so persuasive, and the desire for its successful realization during the First World War so powerful, that when technical innovation caught up with imaginative thought, the time of the ‘Dreadnoughts of the Trenches’ had finally come. I’m not sure if this constitutes a recommendation or a warning, but last night Channel 4 showed a new World War I documentary entitled, ‘War Horse: The Real Story’. This program is now available for viewers to watch again online, on 4 On Demand. If you are interested in a documentary that promises to tell the “extraordinary, moving story” of the horses used in the Great War, “beginning with the mass call-up of horses from every farm and country estate in the land”, I suggest you take a look. I caught a large chunk of the show last night. It does contain some interesting background information about the cavalry and the perils faced by these men and their horses, and some of the footage shown is certainly illustrative of the horrors of the war– a shot of the Hawthorn ridge mine exploding, for example. As far as it goes, there’s some interesting and useful information here to give literature students a sense of historical context. But… but. It’s difficult to watch a documentary like this and not feel a sense of horror at the prospect of all the low-grade, uninspired documentaries about the Great War that will swamp our television screens over the next six years, as we mark the centenary of the war. The narration of the show, when not downright offensive, caught exactly the wrong tone in speaking about the war. Offensive? Try this on for size, when talking about Passchendaele, one of the bloodiest of all the late battles of the war (please read with a softly mournful tone, as if telling a four year old that their pet guinea pig had just died): at Passchendaele, “the horses suffered equally alongside the men”. Really. Really? This was a statement of such cosmic ignorance and such utter lack of empathy with the subject in hand that I had to switch the television off immediately: I find this beats having to install a swearbox in the living room. So I don’t know how the show ends. Sorry about that. AS students who are reading the Jon Stallworthy anthology, however, will recognise from Herbert Asquith’s ‘The Volunteer’ the show’s nostalgic longing for a more honourable age of knights and chargers. Just as the general staff longed for a war of movement, this show longed for the First World War to be a completely different war to the one that was actually fought: one of heroes on horses making the decisive intervention. The program repeatedly showed romantic reconstructions of cavalry silhouetted against the setting sun: “horsemen, charging under phantom skies”, indeed. Of course, the First World War wasn’t like that. The First World War was the end of the cavalry in modern warfare, for obvious reasons: a horse can’t be armoured against enfilading machine gun fire, and works, at best, at roughly one horse power. Horses were, on the other hand, essential for transport and, at the end of the war, meat for starving peasants. The argument that the documentary makes, that “the finest hour of the cavalry came in spring 1918 when – led by the warhorse Warrior – they checked the German advance before going on to help win the war” is, frankly, idiotic. On the contrary, the cavalry was an outmoded institution that no-one in the conservative British Army really knew what to do with, at least on the Western Front. The years of static slaughter during which, at each big push, hundreds or thousands of horse riders would hang about behind the lines waiting for signs of breakthrough, stands as an everlasting testament to the mental inflexibility of the general staff. Similarly, our current fascination with the War Horse seems to be, in part, an attempt to substitute a romantic symbol for ugly reality. We better get used to this desperate revisionism in the years ahead. A remembrance ceremony, conducted at the very edge of the Lochnagar Crater. Dead metaphors. Every English student should be aware of them: little zombie bits of language that once had a life all of their own, but now wander near and far, open-mouthed, vacant. Metaphor, as your English teachers will hopefully have taught you, makes speech and writing vivid. It carries over meanings or concepts from one area of knowledge to another, giving life to the unfamiliar in terms of the familiar. So, to explain, I used a metaphor at the beginning of this article: I compared Dead Metaphors to zombies, speaking about something perhaps a little unfamiliar to you (dead metaphors) in the terms of something more familiar (zombies). Over time, however, these new figures of speech– these metaphors– themselves become familiar through use. They no longer surprise or delight. The original life of the metaphor seeps away. Ultimately you’re left with a word or phrase that is either a cliche (“I’m over the moon”, says the footballer without thinking, meaning he is delighted) or something that has become so common or familiar that you don’t even think of it according to its original metaphorical meaning anymore (“can you grasp that?” says the English teacher to her student). So why the waffle about dead metaphors? Well, the word ‘undermining’ is a dead metaphor. Today most people don’t think twice about the word when they use it. In everyday speech, of course, it means to secretly weaken someone– but we never think about where the word came from. That’s natural: dead metaphors are everywhere and if we stopped talking every time we used one, we couldn’t hold a conversation. Once upon a time, however, to talk about one person undermining another person would have been a vivid, threatening use of language. Undermining, in its original sense, meant to build a mine underneath something– say, a wall– and to use that mine to destroy the object. Mining has been used by the military since ancient times, but undermining became an important military tactic in the middle ages. Besieging armies would build tunnels underneath castle turrets, undermining the foundations of otherwise impregnable towers. They would then build fires (or, later, set off explosives) that would bring the mine down, and the castle walls with it. That’s what undermining was: the way to secretively bring down a city or citadel. The first time someone said, “he’s undermining her” or “they are undermining us” must have been a striking use of speech. So striking, in fact, that someone listening repeated the metaphor– as did the next person. Or, perhaps, this figure of speech occurred to a number of different people as this frightening technology became more and more familiar to people. Ultimately everyone understood it in its new sense: to secretly weaken another person or thing. We very often think of the First World War as a war of innovations in technology, of the shock of the new. Yet it is a striking fact that because 1914-18 was a static war of trenches and fortifications, this old military technique of undermining the enemy experienced a grim resurgence. 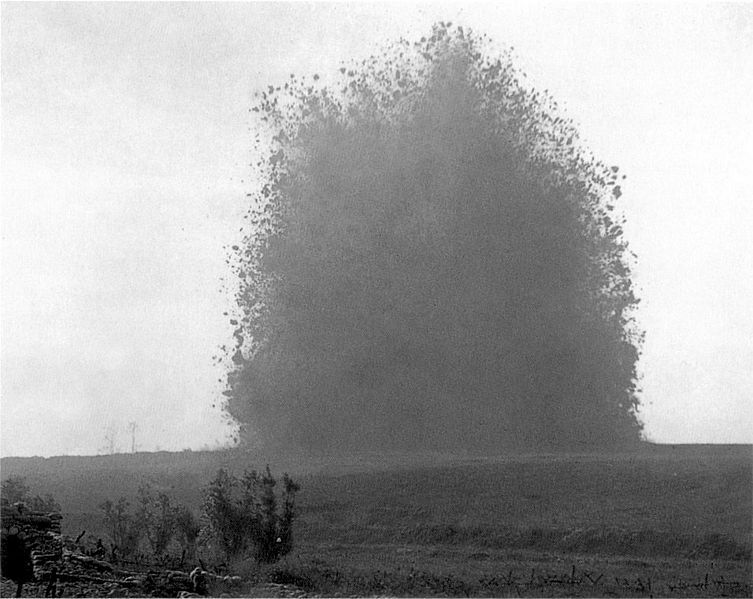 The Hawthorn Ridge mine, exploding on July 1st, 1916, the same day as the munitions that created the Lochnagar crater. This was the first day of the Battle of the Somme. Today we’re going to take a look at a remarkable and horrifying example of undermining that took place during the First World War. At the start of the summer it was announced that a new and extensive archaeological dig is to go ahead, mapping what is known today as the Lochnagar Crater. 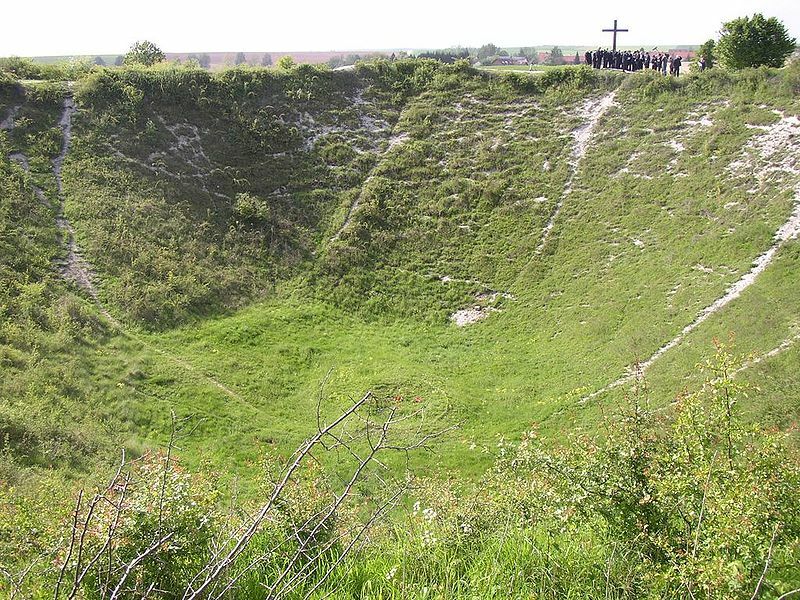 The Lochnagar Crater was created by what was the largest ever mine ever exploded. The explosion took place on the first day of the Battle of the Somme– July 1st, 1916. The Somme has today become a kind of shorthand for a battle with massive loss of life for little obvious gain. Yet as the Somme began there were high hopes that this was the battle which, after the terrible failures of 1915, would lead to movement on the Western Front. A massive attack was to take place on German lines around the river Somme, in the hope of both breaking through those lines and so relieving pressure on the French army at Verdun. The attack on the German line near La Boisselle was to be led by three British Brigades, part of the 34th division. Two were ‘Pals’ brigades– the Tyneside Scottish and Tyneside Irish– raised from Irish and Scottish Communities in the North-East. 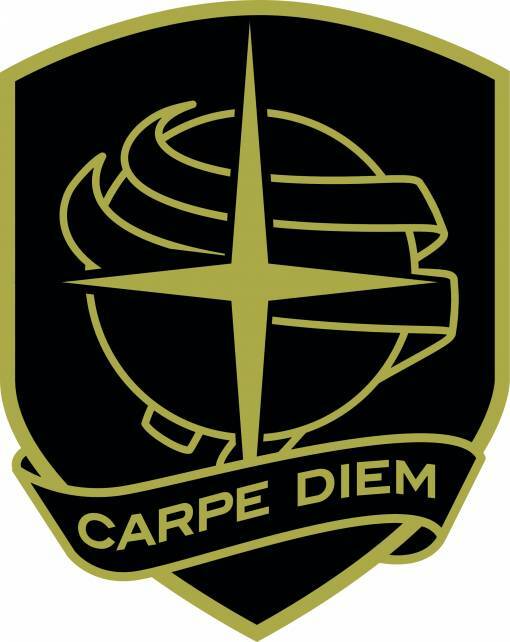 The third, the 101st Brigade, was amalgamation of different companies and regiments that included the Grimsby Pals and other fighting units. The German trenches had sustained a week of incessant bombardment from British artillery in the run up to the first day of the Somme. This alone was expected to have decimated the German defences and demoralised the soldiers sheltering below. Yet, in addition to this form of attack, the British generals wanted to punch a hole in the German line, and to do this they planned to explode a massive pair of mines beneath the German dug outs. The Royal Engineers were employed to dig beneath and undermine the German defences– setting 27 tons of high explosive to go off before the attack. In fact, 28 Royal Engineers were actually killed when the explosives went off at 7.28 on the morning of the 1st. The explosion of the mine was devastating. It lifted the French earth and all those sheltering within it in a massive column 1,200 metres into the air. When the air cleared, what was left where the German dug outs had been was a crater 120 metres wide (that is, around twenty metres longer than a football pitch) and 20 metres deep. You might think that what we today call the ‘shock and awe’ of such a massive explosion would alone result in a British victory in this sector of the battle of the Somme. What followed, in fact, was a disaster for the attacking British troops. The German trenches had been dug deep and those in them had been well sheltered from the hellish bombardment in the week prior. The many German soldiers who had not been killed by the mine explosion simply took their places again in the line once the British artillery ceased (allowing the British soldiers to go ‘over the top’). The British infantry, doubtless expecting minimal resistance, calmly advanced in long lines– as they had been trained– into devastating machine gun fire. Over 6,000 British soldiers died in the attack for the slightest gain in ground. It is, in its own way, a typical story of the disastrously planned and bloodily fought first day of the Somme. You can find out about the new archaeological exploration of the site and the hidden tunnels that run warren-like through the area by linking to this BBC Radio 4 Today news report. It’s clear that even those experienced archaeologists who have begun the task of finding the remains of humans and human activites underground are deeply moved by what they’ve found. You can also read an excellent report on the BBC website about the attack, ‘WW1 underground: unearthing the hidden war’, that contains an TV interview within one of the actual tunnels with historian Simon Jones, explaining what life was like as a miner. As a literature student, to get a sense of the claustrophobic horror that an ordinary soldier experienced in tunnels beneath the battlefields, you should read Siegfried Sassoon’s grim poem ‘The Rear Guard’ (found in the Stallworthy anthology if you are an AQA AS student). You can, of course, find my notes for this poem on Move Him Into the Sun: though as the poem is still in copyright, I can’t reproduce the actual text here. The events of Sassoon’s poem take place near Arras, not La Boisselle, but give a flavour of the sense of recoil a non-miner felt about these tunnels far underground. Today, what came to be known as the Lochnagar crater is now a privately owned memorial that you can visit– and you can find its website here. The website provides shocking footage of a similar mine being let off at the Hawthorn Redoubt (pictured above) and its terrible effects. It’s a chastening lesson in the extreme violence all too common during the First World War. The word ‘undermining’ may never mean quite the same thing again. "I've got a cunning plan." What a life it must be for Tony Robinson. He’s been on British TV fronting ‘Time Team’ — a well-regarded archaeology program– for 17 years now. He’s been politically active his whole life, and involved in countless campaigning movements: indeed, for four years, 2000-04, he was elected to the Labour Party’s National Executive Committee. He’s been vice-chair of the actor’s union, Equity. Everything points to him having lived a full and varied life. Yet, and I guarantee you this, if you were to bump into him in the street, all you could think of saying to him, after a well placed nudge in the ribs, is this: “I’ve got a cunning plan”. Yes, he may have last played Baldrick in a ‘Blackadder’ series in 1989, but it is– and perhaps always will be– as the unfortunate servant to Rowan Atkinson’s hereditary snake that the British nation will remember him. 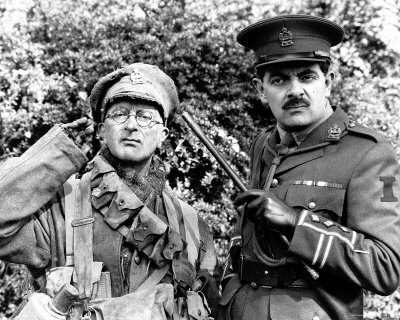 You last saw him (I hope, because the one-offs were dreadful) as Captain Blackadder’s unfortunate batman, Private Baldrick, in one of the finest series of Blackadder, ‘Blackadder Goes Forth’. As a student of the Great War in literature and drama you will have seen this already, of course. Blackadder was, after all, the best UK comedy series of the past 25 years (no arguing at the back). If you haven’t seen it, you can learn how not to make a coffee in the trenches with Baldrick’s help, here. Hmm. Too much talk of Baldrick. I was, rather, going to draw your attention to Tony Robinson’s longest-running role: as the presenter of ‘Time Team’. This week, ‘Time Team’ presented a special on ‘The Somme’s Secret Weapon’, a program that you can find over at Four On Demand. The show usually follows a simple formula: Tony Robinson takes a team of archaeologists to a site which is suspected of hiding archaeological riches. ‘The Somme’s Secret Weapon’ does the same, taking us to a battlefield site in France near Mametz Wood where, on the 1st of July 1916, a terrible new weapon was used by the British as part of that most famous of ‘big pushes’, the battle of the Somme. The team goes in search of the remains of an experimental weapon called the Livens Flame Projector, a monstrous flame thrower used to empty the German trenches before the attack by British troops. I won’t spoil the show for you, but suffice to say: if you are not normally interested in archaeology, Robinson and his team do very well to bring this project– and the frontline trenches– alive for you. One of the ways that they do this is through experimental archaeology. I only know the term from Ms. Thornton, the very intelligent woman with whom I teach English A-level at Southfields. Ms. Thornton, as well as being a brilliant English teacher, is an archaeology student at Birkbeck College, London (incidentally, Isaac Rosenberg’s university too). Experimental archaeology involves recreating the tools and tool-making processes used in the past, and she has done this as part of her archaeological work– smelting metal and making bronze arrow heads with little more than ore, baked mud, clay and dung. This to me sounds rather groovy, like MacGyver in the bronze age. Robinson’s team attempt something similar but larger, with the help of the Royal Engineers, 2,700 litres of Kerosene and diesel, bespoke pipeline and hoses– and two oxy-acetylene blow-torches. Don’t expect the kind of feel-good schmaltz that you normally get at the end of these ‘mission’ documentaries– what the Time Team recreate is something amazing, yet ultimately quite sickening. This Time Team special certainly makes the First World War come alive– and in the most disturbing way. Here’s to you, Tony Robinson. 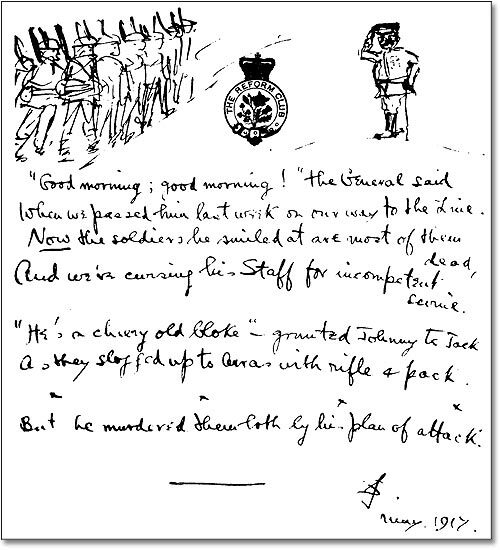 An early draft of 'The General' by Siegfried Sassoon- with accompanying cartoon! A General breezily greets a company of his men as they move up the line towards Arras. His incompetent planning will lead to their deaths. The General: Pointedly anonymous in the poem. The General is a figurehead for the kind of planning that led to massive loss of life during the attritional warfare on the Western Front– Arras being a particularly grim example of the human cost of the war. The Second Battle of Arras was a diversionary battle that took place in April-May 1917 and was intended to draw strength away from a larger French offensive to the south at Aisne. While very successful at first, gaining ground and employing innovative new tactics, by the end of the offensive such advantage had been largely lost and over 150,000 British and Commonwealth soldiers were dead. STRUCTURE: ‘The General’ is written with a distinctive and upbeat rhythm that reflects the General’s manner and which ironically contrasts with the deaths that result from his incompetence. This rhythm is anapaestic. An anapaest is a three syllable foot that comprises of two unstressed syllables followed by one stressed syllable. So, for example, the word ‘anapaest’ is, in fact, anapaestic, as we see here: a-na-PAEST. An anapaestic rhythm bounds and gallops forwards, with that third syllable in every foot being accentuated. There are four feet in every line of ‘The General’, meaning that this meter is known as ‘Anapaestic Tetrameter’. If we break down the rhythm in this way (an act known as scansion) then we can follow this rhythm. The second line scans, for example, like this: “When we MET / him last WEEK / on our WAY / to the LINE / ”. It is a strong, striding, strident rhythm, suitable for a poem such as this. “‘Good-morning; good-morning!’ the General said’”: the breeziness of the General and his pleasant demeanor is used as a powerful contrast to the consequences of his actions. Sassoon’s satirical representation of the General is clever: it suggests (perhaps unfairly) that his upbeat nature somehow reflects a lack of seriousness with which he takes his charge. “on our way to the line.”: the soldiers are making their way to the front. “most of ’em dead”: the inverted comma signifies the lower-class accent of the speaker and dropping of the ‘th’ sound. This class voice gives the poem a more subversive tone. The consequences of the cheery General’s actions are devastating. “And we’re cursing his staff for incompetent swine”: the representatives of the General staff— those soldiers working administratively at the General’s command— were often intensely disliked by the average soldier. Here, their incompetence disgusts the soldiers. “‘He’s a cheery old card,’ grunted Harry to Jack”: the soldiers see the General as a ‘card’, or ‘character’. Their tone is generous, given the physical effort they are making (“grunted”). The names of the soldiers are common and denote that they are ‘typical’ Tommies. This is, obviously, an emotive move: the irony of the men’s appreciative statement shortly becomes clear. “slogged up to Arras”: The Battle of Arras, April-May 1917 (see above). “But he did for them both by his plan of attack.”: the single, end-stopped line at the end of the poem is dramatic, and is the pointed lesson of this poem: that the General and his staff are responsible for the death of the men. Long ago, when the mighty Brontosaurus still roamed the earth, I went to an infants school in a small satellite town in south west London. There, at lunchtimes, we used to play a game of war. This thrilling game began with two kids linking arms and skipping through the playground, chanting, ‘Who wants a game of war? War! Who wants a game of war? War! Who wants a game’- and so on, and so on. Kids would link arms with a boy (more rarely a girl) on either end, until finally a long, tenticular line waved its way across the playground. And that was it. Nobody actually ever played war. The tenticular arm would swing around until everyone got bored and went off to play football. We weren’t a very bellicose bunch, to be honest. So much for the imaginations of children. Why am I mentioning this? Well, a better planned Game of War is in the news this week. It’s not the same game, of course. This war game dates back to 1890, when British school playgrounds really were school playgrounds, and a game of war probably meant boys setting up a maxim gun near the girl’s toilets. ‘The Game of War’ was a military strategy game, based on an original German model known as ‘Kriegspiel’. It was invented as a form of training for late Victorian army officers, and a version of it from around 1890 was on sale at Bonhams Auction House on Monday. As you can see, it’s quite a box, containing incredibly detailed maps and slate playing pieces for either army– and costing between £1500 and £2000 it’s a touch more expensive than a box of Monopoly. Using it, British officers perfected their military strategems and tactics in advance of war. Or so they thought. In the event of war, the game was rather less useful than intended. As is well known, the First World War– on the Western Front, at least– was for the greatest part of four years a long seige of trenches, utilising machine gun emplacements, gas attacks, tanks and massive artillery shelling on a scale never before seen. 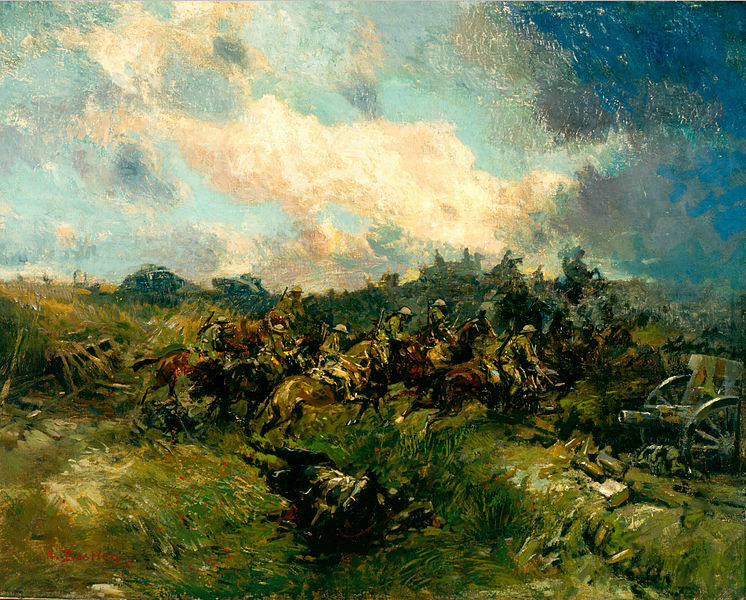 The much-expected “war of movement”– that is, the rapid offensive or defensive movement across territory by cavalry or infantry, as at the Battle of Gheluvelt— was only seen at the very beginning and end of war. The Game of War only had six machine gun units for its entire gameplay. The officers who played the game were preparing for a war that would never take place. Went thundering past beneath the oriflamme. Asquith’s clerk, of course, decides to volunteer and is killed– lying “content”, as the poet proclaims, “with that last high hour, in which he lived and died”. Asquith wants the lesson to be that no matter how contemptible your job– and there is a patronising stink to his picture of the suburban commuter class– you too can live the glittering dream of knightly chivalry and imperial conquest. The remarkable complacency of the kind of culture that produced Herbert Asquith– and it’s too, too relaxed attitude to death– finds a mirror in the strategic unreadiness of the armies of the First World War. It is unfair to use 20/20 hindsight to criticise those who could not see what the future was to bring, but it is hard not to judge harshly the backwards-looking, even nostalgic perspective of certain members of the officer class before the First World War. Was anyone looking ahead, anticipating the dread forms that modern technological warfare would bring? Well, in literature, certainly. Way back in 1879 Jules Verne wrote a today neglected (because pretty dire) novel called The Begum’s Fortune in which the inhabitants of a German city, Stahlstadt, build a new weapon to fire at a Utopian French City, Frankville. It is a form of artillery shell containing carbon dioxide that, when fired in a spread, will suffocate and freeze all beneath the barrage. Verne had been paying attention to the successful use of German artillery during the Franco-Prussian war; but his anticipation of the use of gas in the Great War was cannily accurate. The second writer to grasp the shape of things to come was Verne’s contemporary and close competitor for the title, ‘Father of Science Fiction’: H.G. Wells. Wells, in a visionary 1903 short story called The Land Ironclads, imagined an armoured vehicle that would later come to be called the tank. His great imaginative leap was to wonder if heavily plated battleships (‘Ironclads’) could be imagined fighting, somehow, on land: only the battle of Cambrai in 1917 would bring his fantasy into reality. HG Wells playing ‘Little Wars’. And it is Wells, with his playful and aggressive imagination, that brings us back to the Game of War. 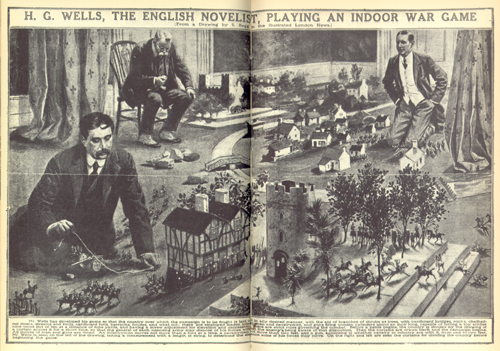 For it was Wells who was the first man to bring the world of Kriegspiel into the living room, with his 1913 game book, ‘Little Wars’. Wells famously loved games– visits to his house in Sandgate inevitably meant playing them, whether the visitors were adults or children. There’s a line to be drawn from Kriegspiel to the Game of War to ‘Little Wars’, all the way to today’s computer games, like ‘Call of Duty’. War games are some of the oldest games there are: and I suppose, on some deep level, there might be something frightening about having them in our living rooms. Yet war games are about playing imaginatively with the highest stakes possible, but without the terrible consequences that actual war brings. It is The Game of War as an officer training tool, however, that shows the tricky middle ground between imaginative play and war: where a lack of imagination has profound consequences in not little, but Great Wars. for students and readers of World War One poetry and prose. Read detailed notes and add your own thoughts. Take a look at our 'Ask Mr. Griffiths' and our 'Welcome' pages to find out more about this blog. To find a list of all posts, check out our Archive at the top of the page. This website began in 2010 as a project of the English department at Southfields Academy, Wandsworth, London UK. To date we have had over a million visits from curious readers. Welcome! Click a Category to find some posts! Click a Tag to find some posts! Cramming for an assessment, or just wanting to keep in touch? What was it Really Like to Fight in the First World War? Click on the image to link to an email address for the creator of this website. Move Him Into The Sun Create a free website or blog at WordPress.com.